The Model 150 is a very versatile tool. 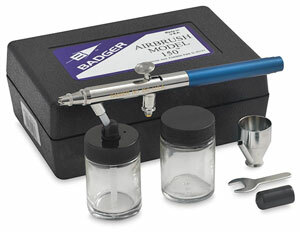 It comes with your choice of head assembly and needle, complete with a ¼ oz (7 ml) color cup, a ¾ oz (22 ml) jar and a 2 oz (59 ml) jar, any one of which fit on the airbrush in seconds. Also included are a protective cap, instructions, and a wrench. The Badger Model 150 Double Action Airbrush has a lifetime PTFE bearing that resists solvents and paint chemicals. This adds up to a complete system that will meet most or all of your airbrushing needs.